It sounds great! And is one of the best steaks you will ever experience. The truth is, the only place you can have authentic Bistecca Fiorentina is in Florence, Italy. Sad but true. Oh, you can make something similar here. The ingredients are simple. Salt, pepper and the one ingredient that is hard to come by…Chianina Beef. You are not going to find this beef in your neighborhood grocery store or butcher. Chianina Beef is a large white oxen type cattle that originated in Italy. It dates back as far as the Roman Empire. This cattle is from the provinces of Arezzo and Siena in the region of Tuscany. And that is where it is raised till this day. The beef is tender and marbled and like so many great Italian dishes, it is prepared quite simply as to bring out the full flavor of the main ingredient. So, why am I posting Bistecca Fiorentina if I can’t make the real thing. Well, I’m posting it more for the story that comes with the Bistecca Fiorentina experience I had while visiting Florence. And I’ll give you the authentic recipe. No where else in Italy can you get a good steak but in Florence. They are known for their Bistecca Fiorentina. Back in the late 70’s when I was married I was visiting my wife’s family in Calabria. On the way down to the tip of the boot we stopped in Rome and visited her Uncle Ferdinando and his family. After spending a few days with the family and touring Rome we took a train to Florence and Zio Ferdinando decided to accompany us. When we arrived in Florence we decided to go get something to eat. I knew I wanted to try their specialty, Bistecca Fiorentina. We choose a modest restaurant in the middle of the city and took our places at the table. I told Zio Ferdinando what I had in mind and he agreed that the Bistecca Fiorentina was something special and we should try it. What I didn’t know was what I was going to get with my steak dinner… a first hand look at “Italian Theatre”. The waiter came over to our table and took our order. We all ordered Bistecca Fiorentina. The waiter was happy with the order and went back into the kitchen and placed it. Now, Zio Ferdinando, like many Italians, are not big beef eaters. If you don’t live near Florence the beef in the rest of Italy is nothing to write home about. It’s actually quite terrible if you can find it anywhere. As soon as the waiter came out of the kitchen, which was only seconds later, Zio Ferdinando called him over and said he had changed his mind and would prefer a plate of cheese and olives with some bread for his meal. The waiter clutched his order pad with both of his hands and brought them up to his chest as he hesitated and stood there frozen. Zio Ferdinando asked him if something was wrong, if there was a problem. The waiter, being the salesman that he was said, ” no problem Signore, I’ll tell the chef”. Zio Ferdinando looked at my wife and me and gestured with his hands, “If there is a problem I’ll have the steak”. Moments later I could hear the two men talking behind the closed swinging doors that led to the kitchen. The voices grew louder and in an instant I heard pots and pans banging to the ground. The level of their conversation grew louder to the point of yelling the way only two Italian men can yell at each other. We all looked at each other and wondered what had we started. The next thing I knew, the chef stormed out from behind the double swinging doors and ripped off his apron and threw it to the ground as he screamed and yelled at the poor waiter, still in the kitchen, and went storming out of the restaurant. The chef passed our table and did not even look our way, he just stormed out of the front door. Zio Ferdinando immediately started shouting something to the waiter that was now coming out of the kitchen with his hands to his head as if he was pulling out his hair. You have to understand that all this conversation was going on in Italian and they were speaking so fast that I couldn’t understand a thing they were saying. I turned towards my wife Gisella to translate all this for me because I couldn’t believe what was happening. The waiter started to explain to Zio Ferdinando that the chef had just QUIT. That he was very upset because he started preparing the Bistecca Fiorentina and had already butchered the meat. Zio Ferdinano explained to the waiter that he was not a big beef eater and that he would have preferred a plate of olives and cheese with some bread. But if he had known that this would happen he would have stuck with the Bistecca Fiorentina. As a matter of fact he would have two Bistecca Fiorentina if that would make the chef happy. “Sure, sure I’ll have the Bitecca Fiorentina”, said Zio Ferdinando, “go tell that maniac out there to calm down”! All this time, as my wife Gisella was translating this for me, I was hysterical. I looked outside the front door and saw the chef out there smoking a cigarette and still yelling towards the restaurant and flailing his arms in all directions. It was like an opera. The waiter said that he would go outside and try and calm the chef down. Sort of a “good cop, bad cop” ploy, I thought. The waiter went outside and both men were still yelling at each other. After the waiter got a word in edgewise the chef looked like he calmed down a bit. He waived his hands a few more times, threw his cigarette to the ground and came back into the restaurant. He stormed right past us, still not giving us even a glance, as he muttered unintelligible Italian words under his breath. As he passed, Zio Ferdinando made a few comments as he raised his hands in the air. The chef picked up his apron and tied it back on as he walked back into the kitchen. This was Italian theatre at its finest. You could never get away with this in the States. But we were not in America. We were in Italy. And the Italian attitude and culture is not like anywhere else. The Bistecca Fiorentna was absolutely delicious. Well worth the price of admission. To prepare this dish the traditional way you have to cook the steak on a hot wood charcoal fire with the flames burned down and just a coating of white ash over the coals. 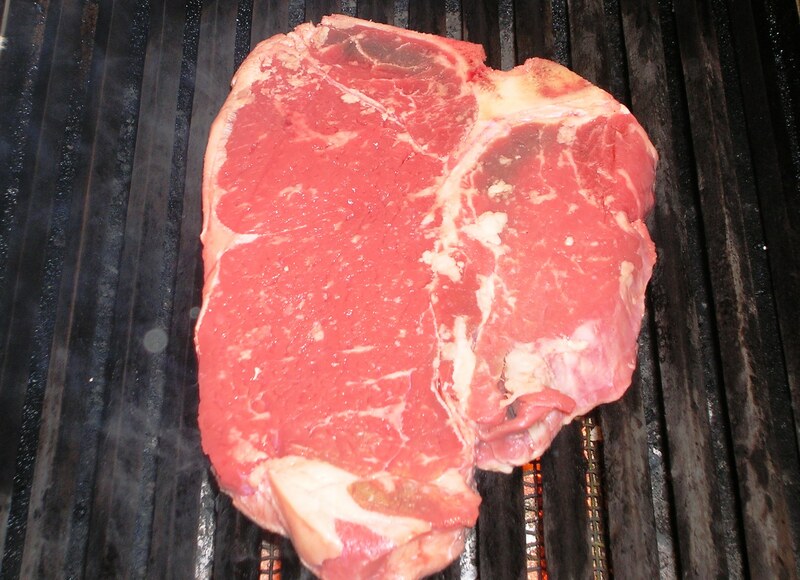 The steaks themselves are a Porterhouse cut of beef about 2″ thick. They should be brought to room temperature before cooking. Place the steaks over the hot coals about 4 inches above the coals. They should cook about 5 minuets on each side for medium rare. After you turn them, never with a fork or anything that might pierce the steak, salt and pepper the cooked side of the meat and leave on the fire for another 5 minutes. When you take the steaks off the fire salt and pepper the other side and allow to rest for a few minutes. 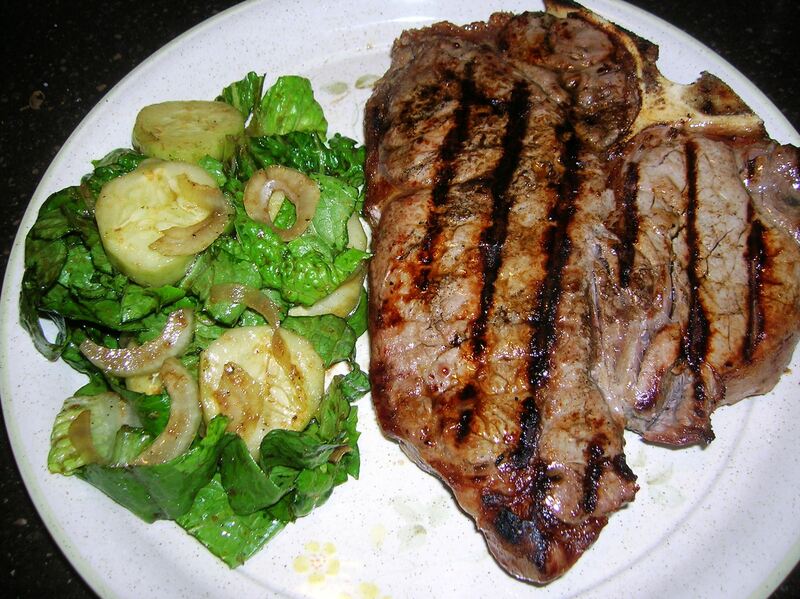 Serve the steak with a plain side salad dressed with some olive oil and vinegar, salt and pepper. 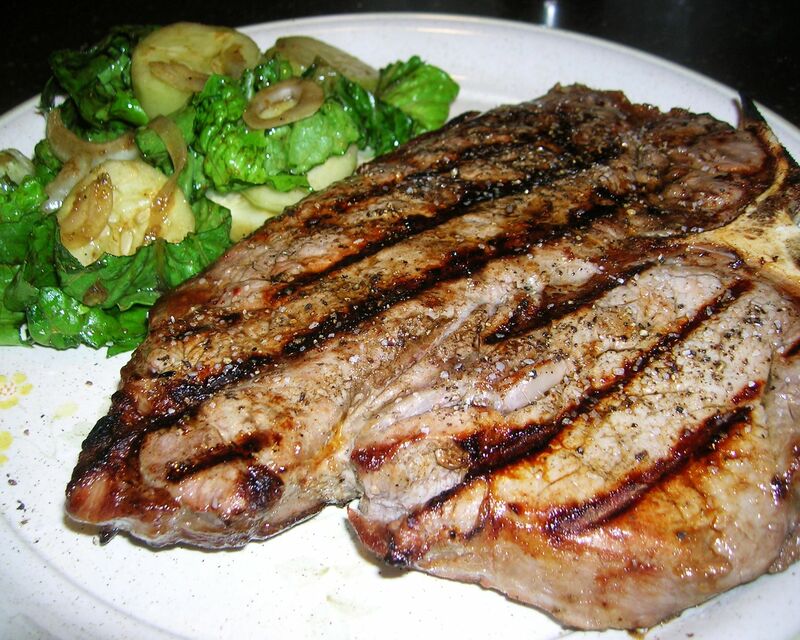 Some recipes call for a coating of olive oil after the steak is cooked and served with some lemon. No, No, No. If you are having the authentic Bistecca Fiorentina you don’t need to flavor the beef with anything but salt and pepper…it’s that good. 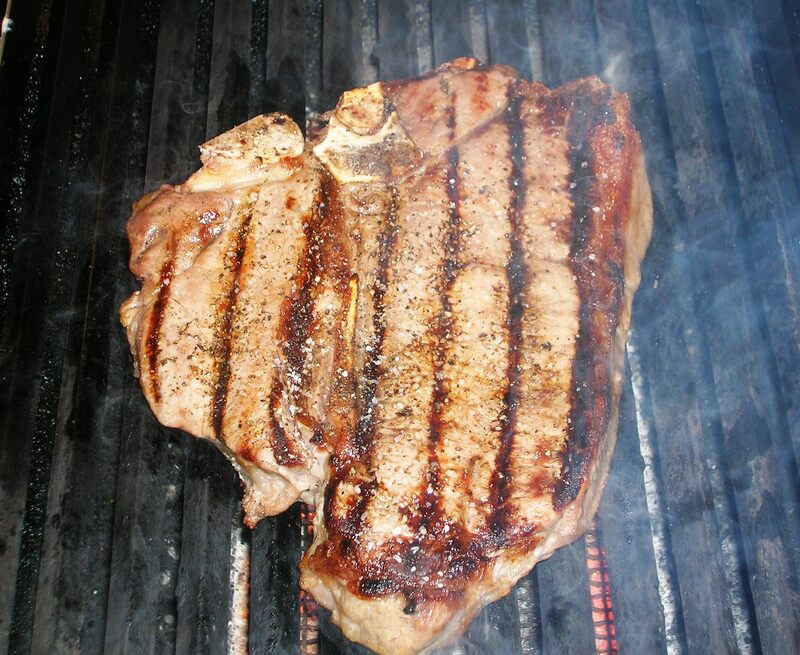 This entry was posted in Beef and tagged Beef Steak, Bistecca Fiorentina, Porterhouse steak. Bookmark the permalink.